A flat tire is an inconvenience any driver can run across. It can be tricky and need experience such as parallel parking tips. Sure, roadside assistance is generally just a phone call away, but knowing how to change a flat tire is a very important life skill. If you do it right by following all the steps properly it should only take approximately 15 to 30 minutes. Changing a tire is not rocket science. Dealing with a flat tire properly only requires the appropriate tools, know-how, and willingness to roll up your sleeves and get to work. 1) Find a safe place to pull over and turn on your hazard lights. If you are on the highway, slowly drive to the nearest exit ramp where you are away from the busy road. Continuously driving on a flat tire to find a suitable place may damage the tire further, but between buying a new one and being hit by a distracted driver, the former is the more palatable choice. If you cannot maneuver to a safe area, put as much space between your car and the traffic by pulling over to the far right. Once you have found your spot, turn on your hazard lights. Better yet, turn them on the moment you hear the flapping sound of a flat tire, right before you pull over. 2) Put the car in park before turning the engine off. This minimizes the chances of your car rolling. If you have a working parking brake, it might be a good idea to make sure that it is activated or engaged. 3) Position flares or reflective triangles behind your car. Particularly important at night or when it is raining, the flares or reflective signs must be bright enough to be noticed from a distance and warn other drivers of a disabled car ahead. If you do not have any flares or reflective signs, it is essential that your hazard lights are flashing so you can be seen. 4) Place the wheel wedges on the opposite side of the flat tire. Position the wheel wedges in front or at the back of the car’s wheel opposite the flat tire. They should hold the car in place while you are changing the tire. If you do not have wheel wedges, look around for a rock or other sturdy object that will help keep the car from rolling. 5) Pry open the wheel cover (hubcap). This step is only applicable when the lug nuts are not exposed. Use the flat end of your lug wrench to pry open and remove the hubcap. Some covers may require a different tool, so check your car owner’s manual if this is the case with your car. 6) Loosen the nuts but do not remove them yet. Use the lug wrench to loosen the nuts. Only completely remove them when you are ready to also remove the tire from the car. If you loosen the lug nuts while your car is raised, you are more likely to cause the car to fall off the jack. This could result in a serious injury. 7) Place the jack underneath the car. Refer to your vehicle’s manual for the exact location and lifting instructions. Improper lifting may damage your car and even endanger your life. Raise the car until the tire is about six inches off the ground. Remember to never put any part of your body under the car. In the unfortunate case that the jack collapses, you are out of harm’s way. 8) Loosen the lug nuts completely. Unscrew the nuts and keep them in a safe place, or if available, turn the hubcap upside down and use as a tray. You will need the same set of nuts to secure the spare tire. 9) Remove the flat tire. Remove the flat by pulling it toward you. Once removed, set it safely aside so it does not roll away. 10) Replace the flat with the spare tire. Replace the flat by mounting the spare into the exposed lug bolts. Push the tire in place. 11) Put back the lug nuts. Put the lug nuts back one by one. Tighten them by hand, not with the lug wrench. Using the wrench with your car raised may cause your vehicle to fall off the car jack. 12) Lower the spare tire. 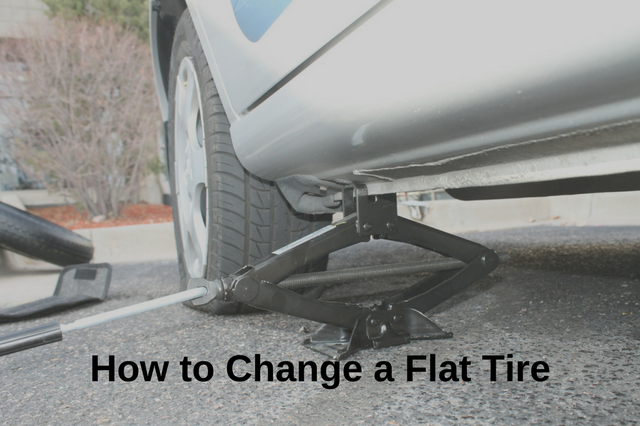 Lower the car using the jack until the spare tire touches the ground. Ensure though that the full weight of the car is equally distributed across all the tires. Remove the jack. 13) Tighten the lug nuts. Using the wrench, tighten the lug nuts. Do this by putting your full weight on the wrench as you turn it clockwise. Tighten the lug nuts in a diagonal direction so that they are evenly aligned. Reposition the hubcap, if you have removed it in a prior step. Measure the spare tire’s air pressure with a tire gauge. If you do not have a gauge, check the pressure in a nearby gas station. Remember to drive and park carefully because spare tires are just temporary replacements and are not meant for high-speed or long-distance driving. How long you can drive on a spare largely depends on the type of vehicle you have. Some cars can carry a full-size spare, while others can only accommodate a narrow, compact spare. Check your car's manual for specific instructions. But as a rule of thumb, traveling on a spare tire should be at a maximum of 50 to 70 miles. Do not forget to stow all the equipment you used - car jack, lug wrench, flat tire, wheel wedges, and reflective triangles, among others - in the car before you drive away. 17) Have the tire checked by an expert. Last but not least, take your car to a professional and have them determine whether your flat tire can still be repaired or if you will need to purchase a replacement. The ability to change a flat tire on your own is essential for drivers of all ages. So when you are replacing a defective tire, keep the above steps and tips in mind. If you are searching for a driving school that can adequately equip your teenage driver with the necessary road smarts, Western Slope Driving Institute is a Littleton drivers education institution with former law enforcement experts as driving instructors. Give us a call to get your teenager signed up for any of our driver’s ed courses.